Jay’s pick for October Dinner Club with the Jacksons was a last minute call, chosen for it’s location close to the city and sticking with our years theme of ‘cheap & cheerful‘! 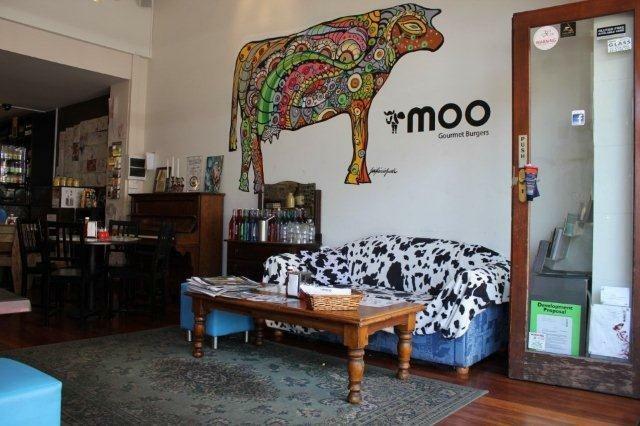 Moo Gourmet Burgers on King St Newtown is a fun, casual, quirky cafe that servers burgers, sides & a couple of desserts. 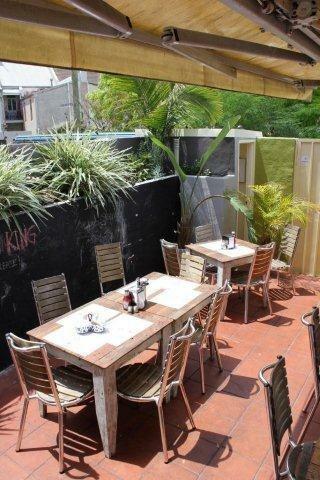 It’s also licensed so you can order beers, the odd cocktail & wine. They have 19 burgers! That’s right – nineteen! 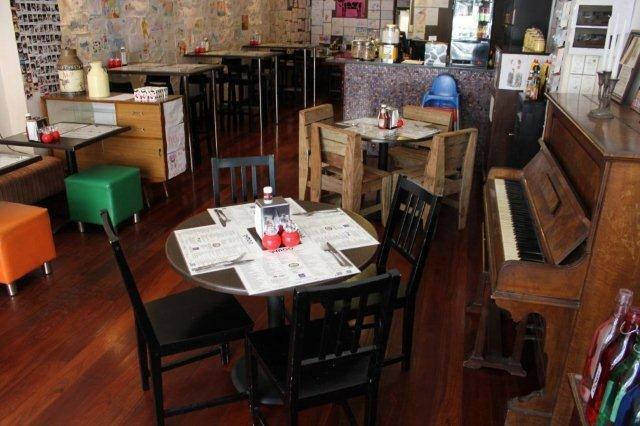 Plus they cater for vegetarians and even have a mini-moo menu for kids. We all meet after work and sit ourselves in a big communal table. You order at the bar and drink our beers while we wait for our orders to arrive. Jay & I both order the Big Moo burger although I have mine with no egg. The burgers are GIGANTIC! And believe it or not it’s only half the size of the Deluxe Moo! 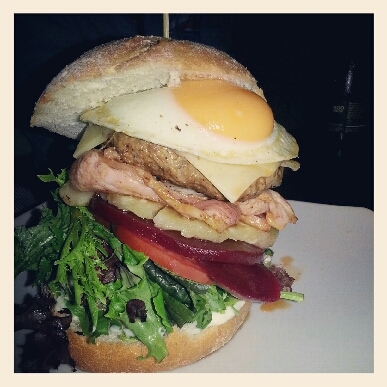 The perfect burger tower is filled with 100% Aussie Angus beef pattie that is as round as the bun, cheddar cheese, free range bacon, free range egg (for Jay), pineapple, beetroot, tomato, mixed lettuce leaf, home-made mayo & tomato relish. The bun is rustic style with no sweetness. 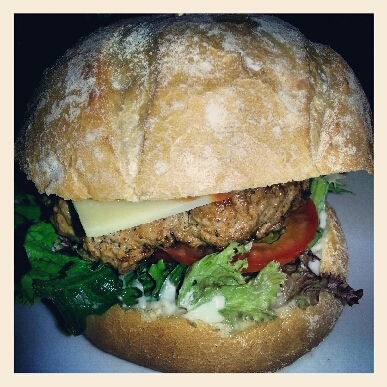 The burger tastes and looks like a really good home-made burger. It’s awesome! Ian orders the Classic Cheese Burger which has the Angus beef pattie, cheddar cheese, tomato, mixed lettuce leaf, home-made mayo & tomato relish. 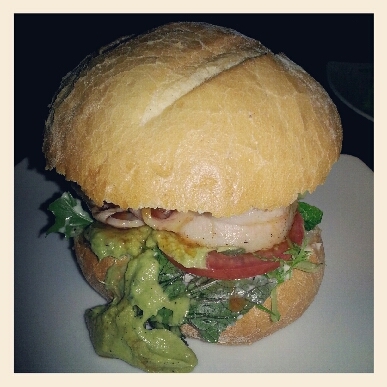 Janine goes for the chicken option and orders the Chicken, Avocado & Bacon Burger which comes filled with grilled free-range chicken breast, avocado puree, free-range bacon, mixed lettuce leaf & home-made mayo. 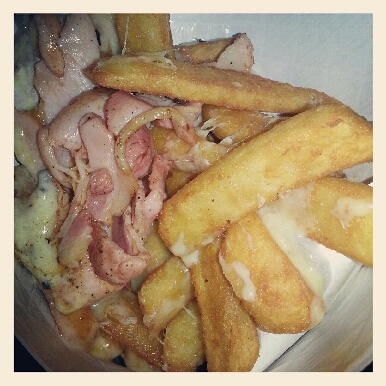 We share a couple orders of Cheesy Bacon Chips & Sweet Potato Fries which could stop your heart simply by looking at them! We sit, digest & catch-up for a while before ordering dessert to share; a Moo Split which is a tempting boat of banana, icecream, chocolate syrup, crushed nuts, whipped cream, smashed Crunchie & Snickers with a cherry on top. We are in diabetic heaven! 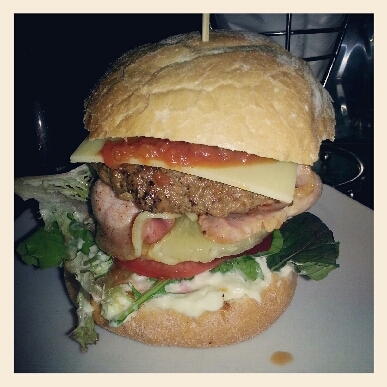 So as a true burger lover I can, with 100% conviction, say that this Moo burger is better than Grill’d! Wow that looks amazing, I don’t eat hardly any beef, but that I would eat!! I know they are HUGE! But sometimes you just need to over-indulge!!! Are you still alive? Have you had a heart attack yet? Did you seriously eat dessert? 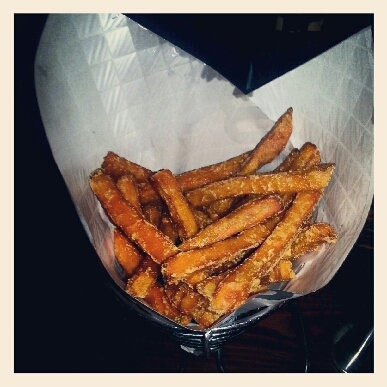 Those fries look good but. Is it strange that I think the buns are what is appealing to me the most on those burgers? nothing is strange when you’ve got a bun of your own in the oven!!! have you had any weird cravings (like pickles & icecream)??!!?? Nothing weird, I just find myself not liking onions as much (I loved them pre-pregnancy) I want BBQ quite often, BBQ is like my crack now! I eat more pork, melons and citrus. Way better than with Emma, I hated peanut butter and the taste of water during that pregnancy and only wanted to eat hot dogs microwave burritos with melted cheese and taco sauce as well as pina colada Slurpees.